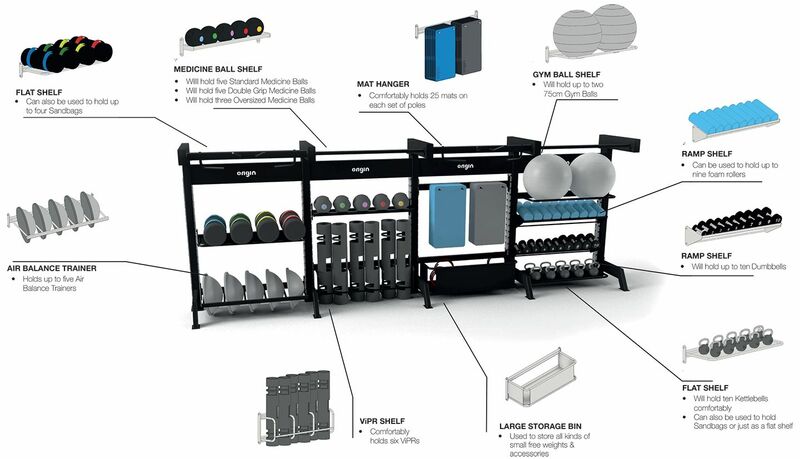 Take your gym to the next level with custom storage and a versatile functional rig – all in a simple modular solution. Our modular storage solution combines the versatility offered by functional rigs with a tailored and equally flexible gym equipment storage system. We’re giving gyms the opportunity to build a system that perfectly complements the space available, which can be configured to meet their precise storage needs as well as enhancing the training options on offer within a space. Add and adjust storage shelving as required to hold everything from dumbbells and sandbags to gym balls and VIPRs. The storage cells also offer suspension anchors and pull-up bars, and that’s before we even mention the bridge! Can be completely tailored to the space you have available. Offers a huge array of potential configuration options. Storage shelves cater for a wide range of equipment shapes, sizes and brands. Combines key features from a functional rig with the best in storage solutions. Helps maximise the space available within your gym. Enhances the training options on offer with a wide range of attachments. Expand, adapt and add new features to meet your ever-changing needs. Interested in the Origin Modular Storage Rig?